Here’s one reason we’re stuck in slow growth mode: the budget crunch among state and local governments. The figure shows the yearly percentage point contribution to or subtraction from real GDP growth from the state and local sectors since the late 1980s. The trend bounces around but the recent cliff dive is evident. It’s also why we keep losing jobs in these sectors month after month. Unlike the feds, states have to balance their budgets every year, which means they either raise taxes or cut services. They haven’t done much on the tax side, so they’ve been laying off teachers, cops, maintenance workers; practically every month over the past few years we’ve been adding private sector jobs and shedding public sector jobs. In a very real sense, what you have here is a microcosm of austerity measures at work in cities and towns across the country. Moreover, this drag on growth is avoidable. One of the most successful parts of the Recovery Act was state fiscal relief, as those dollars went directly to preserving state and local jobs. The American Jobs Act proposed $35 billion to build on that progress, resources that would have prevented hundreds of thousands of ongoing layoffs. But it languishes in the dysfunctional Congress and we’re left with the fiscal drag you see in the figure. Share the post "What a Drag"
28 comments in reply to "What a Drag"
And exactly *why* does it always appear that the right wing wants to push services to the state and local level? This post is puzzling to me. Because state and local governments are subject to balanced budget constraints, the reduction in their spending on schools, police, roads, etc., is largely a result of [unplanned] decreases in revenues from their generally regressive taxes. Don’t these [unplanned] tax reductions have a counter-cyclical effect that largely offsets the effect of the decreases in non-federal government spending? In other words, my house is worth less so my property taxes are lower, so the County has less to spend, but I have more. As a related point, a few years back when state & local tax revenues were flooding in, wasn’t the stimulative effect of the resulting increases in state & local government spending largely offset by the effects of the higher taxes on consumer spending? I understand your point that federal grants to states & local governments could have a stimulative effect, but if you look only at state & local governments revenue and expenditures, isn’t the net effect on GDP of falling non-federal tax revenues and spending pretty modest? The implication here is that progressive taxation will offset recessions but it demonstrably doesn’t work that way. After tax incomes tend to decline in recessions–they may not decline as much as pretax incomes if you fall into a lower bracket, but that effect doesn’t come anywhere close to offsetting the downturn. States in particular face procyclical policy choices–ie, tax increases or service cuts. “One of the most successful parts of the Recovery Act was state fiscal relief, as those dollars went directly to preserving state and local jobs. The American Jobs Act proposed $35 billion to build on that progress, resources that would have prevented hundreds of thousands of ongoing layoffs. But it languishes in the dysfunctional Congress and we’re left with the fiscal drag you see in the figure.” Amen – a few of us over at Econospeak have been advocating a return to Federal revenue sharing. Government expenditures can only reduce the utility of funds. It does not increase wealth of a territory but can only increase wealth for a subset of the population. In this case government employees, thier friends and contractors. This is self-evident because instead of people spending the money themselves, a costly beuracracy is established to do it for them. This beuracracy will redistribute the funds to friends, people of power, favored contractors, themselves, and those who have not earned the money. I understand that this harms recievers of the welfare but this consquence does not change the fact that none of these groups earned the funds. It would be an incentive to earn some of thier own. So schools, roads, Social Security, the police, the army – by your logic, all these things are a waste of money. Furthermore, any organization (such as a large business, for example) where people don’t buy everything for themselves because the business buys things, by definition, is wasting money by paying people to spend money instead of everybody spending it themselves. In an office for example, everyone should buy their own paperclips, right? Regarding utility: we are in a liquidity trap. The private sector is not utilizing resources. The government’s job it’s to prime the pump, and to encourage stability. On your last point,you are literally saying that our servicenen, policemen, librarians, etc. do not earn their funds. That is a lie. Nothing could be more self-evidently far from the truth. 1) Call me when anyone you know builds a road anywhere except from the road in front of their property to their front door/garage/barn. Just one example. And because their profit is not measured in bonuses paid to executives at the end of the quarter, but by whether the bridge is up, or the sewer still whole, 50 years from now. Not sure what this is saying, but glad to see some international penetration! Jared Bernstein continues to correctly note that the weak-looking U.S. economic recovery is spoiled by how much budgets are being cut at the state and local level. Is there any source as to how large the state grants were? Is there a logical explanation for the steep drop in the chart in the 2002-2003 period? This appears to be more than just bouncing around. According to CBPPs Nick Johnson–he wrote the piece to which I linked–it’s the lagged effect of the 2001 dot.com bust and recession. Seems to me that the state budget cuts are being used to push a right wing pro-privatization agenda, especially concerning services for healthcare and education. As we have seen many military responsibilities have been outsourced to private contractors at a higher cost to the tax payer, privatizing state services will eventually be a bigger drain on government funds. What are you thoughts on this? The way to understand the chart is how much combined state and local spending grows faster or slower than GDP. This means if the economy grew by 2.8% in a year but the the above chart had a value of “0.0”, state and local spending increased by 2.8%. 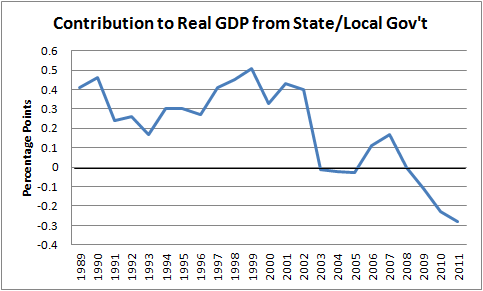 from 1989 to 2002 state plus local spending grew significantly more rapidly than GDP. and from 2008 to 2011 growth was slower than GDP. As you see at end of that chart, real st/loc spending fell in recent years, even as the economy grew. Don’t forget that although most states nominally have balanced budget amendments, there are all sorts of creative accounting tricks that states use to shift money around and run effective deficits. Some liberal bastions like Illinois and California have been contorting their budgets for decades, and when the recession hit they were not able to continue the charade. Put the blame squarely where it belongs, the liberals across America that refuse to implement sustainable fiscal policies. Do you have anything to back up your bold assertion/assumption? Looking at 2010 (the most-recent year with actual figures), the states with the highest growth rates were North Dakota, New York, Indiana, Massachusetts and Virginia. At the top, there seems to be a pretty even distribution of “Red” and “Blue” states. (Bottom 5 growth rates, however: Wyoming, Nevada, Arizona, Oklahoma, Montana.) We can cherry-pick states to attempt to prove whatever point. Yes, California and Illinois had low growth rates, while Texas did better than both of them – on growth rate. However, California – due to the size of its economy – contributed more to our national growth than Texas did. Alas, such information will not be accepted by ideology-powered filters. There’s a simple solution, Jared Bernstein should use the data he already has at hand to settle the question. This isn’t about growth rates, so I don’t understand why you’re bringing it up? It’s about the contribution of state/local governments to GDP. Even better would be a national map showing which cities/counties most contributed to the shrinking government share of GDP. And again, dollars to doughnuts, my guess is that it’s predominantly the liberal states, the liberal urban areas, etc. Maybe you should mention your topic in your original post; otherwise, it appears that you are moving the goalposts to avoid being nailed down by factual information. If it’s about GDP, and/or the contribution by state & local governments, where is that mentioned in the original post? Now, having avoided backing up your original assertion with reference information of any sort, you appear to be saying that librul states/cities/cantons/sleeper cells contributed most to the shrinking GDP. So you are saying that those librul local governments were the most effective at cutting spending in recent years? The amazing religious quality of many “conservative” responses are always astounding. When evidence is presented, instead of responding with counter-evidence, we get off-track suspicions. We know that “liberal” states are net-payers in the tax game — that New York pays for Alabama. So on the one hand, any stimulus funding has to be a shift from “liberal” to “conservative” states, and on the other hand any lack of stimulus will cause a short-fall primarily in “conservative” states, while allowing “liberal” states to offset local short-falls with a reduced federal burden. We know that what is unsustainable, by simple historical fact, are the economic and cultural policies of “conservative” states, by the very fact that they’ve been kept afloat for generations by “liberal” states. It’s unfortunate that reality undermines your religious position. Pick a more sensible one. For every “liberal” state facing budget issues, there are “onservative”sates in the same boat (Texas?). Liberal/Conservative has no bearing on a persons ability to balance the checkbook. If your boss comes to you and tells you that you are going to take a pay cut you will struglle. Uness you make significantly more than you need to live, which state governments do not. That entices inside of me a fear. The only thing is pleasant to see some international penetration!